I must say that I love fish and I love fish simply grilled with some tacit flavors grazing the surface. And when we are at fish, salmon is my favorite. 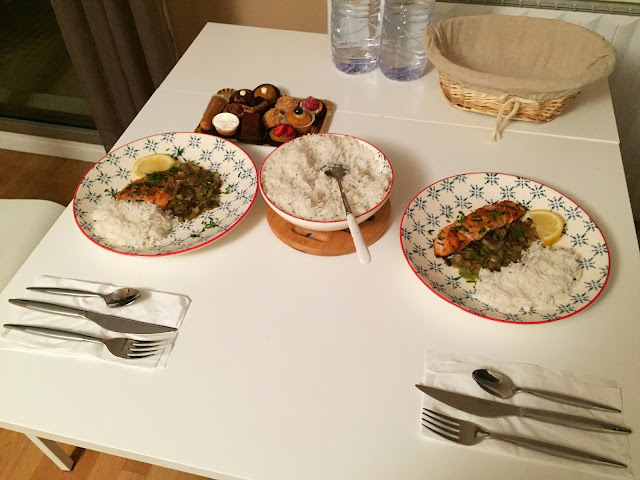 So last Sunday I got myself some fresh Atlantic Salmon from the morning market of our neighborhood. In France there is a saying that the months ending in the ‘r’ sound (Septembre, Octobre, Novembre, Décembre, Janvier and Février in French) are best for fish and sea-food. So as the fall started, it was perfect for me to try my hand out at Salmon. Here is my simple recipe of Grilled Salmon with leek and chives. 3) Marinate the salmon with lemon juice and salt for 15 minutes. Then discard the lemon juice and place the salmons in a zip-lock bag. Add chopped garlic, fresh thyme, virgin olive oil and freshly ground black pepper. Message it a bit and place it in the lower racks of the refrigerator for 30 minutes to 1 hour. 4) Pour the oil, garlic and thyme from the refrigerated zip-lock bag in a non stick pan and then place the salmons skin side down. 5) Cook it for 3-5 minutes in medium heat and then change the sides, season it with salt and repeat the process. Just before the fish is completely done, change the side and add the chopped chives. 6) The grilled salmon is ready, now remove the salmon and discard the garlic and thyme. Add a little olive oil and chopped garlic to it. When it turns golden, add the leek, season it with salt and pepper and stir fry. 7) When it turns slightly golden in color, it is ready to be served. I prefer serving it with steamed basmati rice. A simple recipe for Grilled Salmon with leek and chives. Chop the garlic and chives finely. Chop the leek in dices. Marinate the salmon with lemon juice and salt for 15 minutes. Then discard the lemon juice and place the salmons in a zip-lock bag. Add chopped garlic, fresh thyme, virgin olive oil and freshly ground black pepper. Message it a bit and place it in the lower racks of the refrigerator for 30 minutes to 1 hour. Pour the oil, garlic and thyme from the refrigerated zip-lock bag in a non stick pan and then place the salmons skin side down. Cook it for 3-5 minutes in medium heat and then change the sides, season it with salt and repeat the process. Just before the fish is completely done, change the side and add the chopped chives. The grilled salmon is ready, now remove the salmon and discard the garlic and thyme. Add a little olive oil and chopped garlic to it. When it turns golden, add the leek, season it with salt and pepper and stir fry. When it turns slightly golden in color, it is ready to be served. I prefer serving it with steamed basmati rice.